"John Sousa" redirects here. It is not to be confused with John Souza. 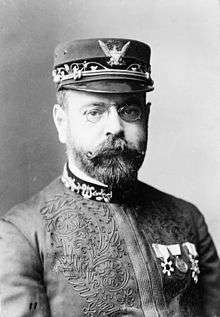 John Philip Sousa (/ˈsuːsə/;[lower-alpha 1] Portuguese pronunciation: [ˈso(w)zɐ]; November 6, 1854 – March 6, 1932) was an American composer and conductor of the late Romantic era, known primarily for American military and patriotic marches. Because of his mastery of march composition, he is known as "The March King", or the "American March King" due to his British counterpart Kenneth J. Alford also being known by the former nickname. Among his best-known marches are "The Stars and Stripes Forever" (National March of the United States of America), "Semper Fidelis" (Official March of the United States Marine Corps), "The Liberty Bell", "The Thunderer" and "The Washington Post". Sousa's father was of Portuguese and Spanish descent, his mother of Hessian ancestry. Sousa began his career playing violin and studying music theory and composition under John Esputa and George Felix Benkert. His father enlisted him in the United States Marine Band as an apprentice in 1868. After departing the band in 1875, Sousa learned to conduct. From 1880 until his death, he focused exclusively on conducting and the writing of music. He eventually rejoined the Marine Band and served there for 12 years as director. On leaving the Marine Band, Sousa organized his own band. He toured Europe and Australia and developed the sousaphone, a large brass instrument similar to the helicon and tuba. At the outbreak of World War I, Sousa was commissioned as a lieutenant commander and led the Naval Reserve Band in Illinois. Following his tenure, he returned to conduct the Sousa Band until his death in 1932. In the 1920s he was promoted to lieutenant commander in the naval reserve, but never saw active service again. John Philip Sousa was born in Washington, D.C., the third of ten children of João António de Sousa (John Anthony Sousa) (Seville, 22 September 1824 - 27 April 1892), who was of Portuguese and Spanish ancestry (son of João António de Sousa and wife Josefina Blanco, from Seville), and his wife Maria Elisabeth Trinkhaus (Darmstadt, 20 May 1826 - 25 August 1908), who was of Hessian ancestry (daughter of Peter Trinkhaus and wife Catherine Schafers). Sousa started his music education by playing the violin as a pupil of John Esputa and George Felix Benkert for harmony and musical composition at the age of six. He was found to have absolute pitch. During his childhood, Sousa studied voice, violin, piano, flute, cornet, baritone horn, trombone, and alto horn. When Sousa was 13, his father, a trombonist in the Marine Band, enlisted him in the United States Marine Corps as an apprentice to keep him from joining a circus band. Several years long after serving his apprenticeship, Sousa joined a theatrical (pit) orchestra where he learned to conduct. He returned to the U.S. Marine Band as its head in 1880 and remained as its conductor until 1892. Sousa led "The President's Own" band under five presidents from Rutherford B. Hayes to Benjamin Harrison. 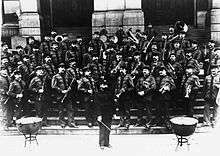 Sousa's band played at two Inaugural Balls, those of James A. Garfield in 1881, and Benjamin Harrison in 1889. The marching brass bass, or sousaphone, a modified helicon, was created by J. W. Pepper – a Philadelphia instrument maker who created the instrument in 1893 at Sousa's request using several of his suggestions in its design. He wanted a tuba that could sound upward and over the band whether its player was seated or marching. The sousaphone was re-created in 1898 by C.G. Conn and this was the model that Sousa preferred to use. He organized The Sousa Band the year he left the Marine Band. The Sousa Band toured from 1892 to 1931, performing at 15,623 concerts both in America and around the world, including at the World Exposition in Paris, France and at the Royal Albert Hall in London. In Paris, the Sousa Band marched through the streets to the Arc de Triomphe – one of only eight parades the band marched in over its forty years. On December 30, 1879, Sousa married Jane van Middlesworth Bellis (1862–1944). They had three children: John Philip, Jr. (April 1, 1881 – May 18, 1937), Jane Priscilla (August 7, 1882 – October 28, 1958), and Helen (January 21, 1887 – October 14, 1975). All were buried in the John Philip Sousa plot in the Congressional Cemetery. Wife Jane, daughters Jane Priscilla and Helen Abert joined the Daughters of the American Revolution (DAR) in 1907. Their ancestor was Adam Bellis, who served under several different commands for the New Jersey troops in the American Revolutionary War. Late in his life, Sousa lived in Sands Point, New York. Sousa died of heart failure at the age of 77 on March 6, 1932, in his room at the Abraham Lincoln Hotel in Reading, Pennsylvania. He had conducted a rehearsal of "The Stars and Stripes Forever" the previous day with the Ringgold Band. 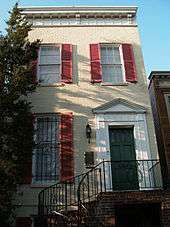 He is buried in Washington, D.C.'s Congressional Cemetery. A school (John Philip Sousa Elementary) and a band shell were named after him and there was a memorial tree planted in nearby Port Washington, New York. Wild Bank, his seaside house on Hicks Lane, has been designated a National Historic Landmark, although it remains a private home and is not open to the public. He was posthumously enshrined in the Hall of Fame for Great Americans in 1976, one of just 102 Americans ever to be honored in such a manner. Sousa served two periods of service in the United States Marine Corps. He first enlisted on June 9, 1868 at the age of 13 as an apprentice musician. In official records, his initial rank was listed as "boy". He re-enlisted on July 8, 1872 and was promoted to musician. He left the Marine Corps in 1875 at the age of 20. His second period of Marine service was from 1880 to 1892. During this period he was the leader of the Marine Band in Washington, D.C. (Some sources state that Sousa served with the rank of Sergeant Major and was eventually promoted to Warrant Officer but this is erroneous as the leader of the band was a separate rank from sergeant major and the Marine Corps did not have warrant officers until 1916.) Sousa's salary as "leader of the band" (his official Marine Corps rank) was $83 per month which compared to a second lieutenant at $115.67 per month and a sergeant major with 20 years of service at $30 per month. Under his leadership, the Marine Band became the premier military band in the United States. The Columbia Phonograph Company produced 60 cylinders of recordings of the Marine Band conducted by Sousa. 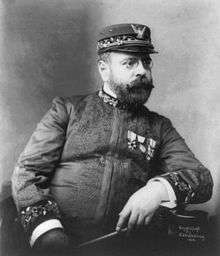 The recordings, along with two tours in 1891 and 1892, led to Sousa becoming nationally famous. During his time with the Marine Band, Sousa composed several of his famous marches including The Washington Post, The Thunderer and Semper Fidelis which remain staples of marching bands to this day. In July 1892, Sousa requested, and received, a discharge from the Marine Corps to pursue a financially promising civilian career as a band leader. He conducted a farewell concert at the White House on July 30, 1892 and was discharged from the Marine Corps the next day. On May 31, 1917, shortly after the United States declared war on Germany and entered World War I, Sousa was commissioned as a lieutenant in the United States Naval Reserve. At that time, Sousa was 62 years old which was then the mandatory retirement age for Navy officers. During the war, Sousa led the Navy Band at the Great Lakes Naval Station near Chicago, Illinois. Being independently wealthy at this point in his life, he donated most of his naval salary, except a token $1 per month, to the Sailors' and Marines' Relief Fund. Sousa was discharged from active duty after the war's end in November 1918. He returned to conducting his own band but continued to wear his naval uniform for many of his concerts and other public appearances. In the early 1920s, he was promoted to the rank of lieutenant commander in the Naval Reserve but did not return to active duty. For this service during the war, Sousa received the World War I Victory Medal. By right of his wartime service, he was elected as a Veteran Companion of the Military Order of Foreign Wars. Sousa was decorated with the palms of the Order of Public Instruction of Portugal. He also received the Royal Victorian Medal from King Edward VII of the United Kingdom in December 1901 for conducting a private birthday concert for Queen Alexandra. During World War II, the Liberty ship SS John Philip Sousa was named after him. The ship's bell is still used by the Marine Band in concert. Sousa has a star in his honor at 1500 Vine Street on the Hollywood Walk of Fame. In 1976, Sousa was inducted into the Hall of Fame for Great Americans. In 1998, he was inducted into the American Classical Music Hall of Fame in Cincinnati, Ohio. The band hall of the Marine Band was dedicated as "John Philip Sousa Band Hall." In 1987, an act of Congress named "The Stars and Stripes Forever" as the National March of the United States. Sousa wrote 137 marches, 15 operettas, 5 overtures, 11 suites, 24 dances, 28 fantasies, and 322 arrangements of nineteenth-century western European symphonic works. Sousa's "Semper Fidelis", the official march of the United States Marine Corps, performed by the U.S. Marine Band in June 1909. The Gladiator March, Sousa's first hit. "King Cotton", an 1895 Sousa military march. "The Gallant Seventh", was in the 1920s and is distinguished as his only march with two breakstrains. "Manhattan Beach", a commemorative march by John Philip Sousa. "The Black Horse Troop" (1924) (written in honor of Troop A, 107th Cavalry, Ohio National Guard). Sousa wrote marches for several American universities, including the University of Minnesota, University of Illinois, University of Nebraska, Kansas State University, and Marquette University. The Bride Elect (1897), libretto by Sousa. The American Maid (1909), also known as The Glass Blowers. Marches and waltzes have been derived from many of these stage-works. 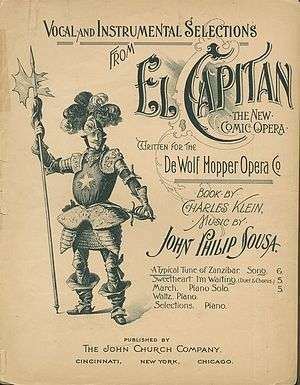 Sousa also composed the music for six operettas that were either unfinished or not produced: The Devils' Deputy, Florine, The Irish Dragoon, Katherine, The Victory, and The Wolf. In addition, Sousa wrote a march based on themes from Gilbert and Sullivan's comic opera The Mikado, the elegant overture Our Flirtations, a number of musical suites, etc. He frequently added Sullivan opera overtures or other Sullivan pieces to his concerts. He was quoted saying, "My religion lies in my composition". Sousa had several additional interests outside of music. He wrote three novels – The Fifth String, Pipetown Sandy, and The Transit of Venus – as well as a full-length autobiography, Marching Along and numerous articles and letters-to-the-editor on a variety of subjects. He participated in trapshooting, taking an active role on the national stage in competitions. As a trapshooter, he ranks as one of the all-time greats, and is enshrined in the Trapshooting Hall of Fame. He organized the first national trapshooting organization, a forerunner to today's Amateur Trapshooting Association (ATA). Sousa remained active in the fledgling ATA for some time after its formation. Some credit Sousa as the father of organized trapshooting in United States. He also wrote numerous articles about trapshooting. Sousa was a regular competitor representing the United States Navy in trapshooting competitions, particularly against the United States Army. Available records indicate that Sousa registered more than 35,000 targets during his shooting career. A quote from his Trapshooting Hall of Fame biography says it best: "Let me say that just about the sweetest music to me is when I call, 'pull,' the old gun barks, and the referee in perfect key announces, 'dead'." In his 1902 novel The Fifth String, a young violinist made a deal with the Devil for a magic violin with five strings. The strings can excite the emotions of Pity, Hope, Love and Joy – the fifth string was of Death and can be played only once before causing the player's own death. He was unable to win the love of the woman he desired. At a final concert, he played upon the death string. In 1905, Sousa published a book Pipetown Sandy, which included a satirical poem titled "The Feast of the Monkeys". The poem described "a lavish party attended by variety of animals, however, overshadowed by the King of Beasts, the lion...who allows the muttering guests the privilege of watching him eat the entire feast". At the end of his gluttony, the lion explained, "Come all rejoice, You've seen your monarch dine." In 1920, he wrote a 40,000-word story, "The Transit of Venus". It was about a group of misogynists called the Alimony Club who, as a way of temporarily escaping the society of women, embark on a sea voyage to observe the transit of Venus. The captain's niece, however, had stowed away on board and soon won over the men. Sousa also wrote a booklet, "A manual for trumpet and drum", published by the Ludwig drum company, with advice for playing drums and trumpet. An early version of the trumpet solo to "Semper Fidelis" was included in this volume. Sousa in 1900, by Elmer Chickering. These talking machines are going to ruin the artistic development of music in this country. When I was a boy...in front of every house in the summer evenings, you would find young people together singing the songs of the day or old songs. Today you hear these infernal machines going night and day. We will not have a vocal cord left. The vocal cord will be eliminated by a process of evolution, as was the tail of man when he came from the ape. Law professor Lawrence Lessig cited this passage to argue that in creating a system of copyrights in which control of music is in the hands of record labels, Sousa was essentially correct. Sousa's antipathy to recording was such that he almost never conducted his band when it was being recorded. Nevertheless, Sousa's band made numerous recordings, the earliest being issued on cylinders by several companies, followed by many recordings on discs by the Berliner Gramophone Company and its successor, the Victor Talking Machine Company (later RCA Victor). The Berliner recordings were conducted by Henry Higgins (one of Sousa's cornet soloists) and Arthur Pryor (Sousa's trombone soloist and assistant conductor), with Sousa quoted as saying, "I have never been in the gramophone company's office in my life." A handful of the Victor recordings were actually conducted by Sousa, but most were conducted by Pryor, Herbert L. Clarke, Edwin H. Clarke, or by four of Victor's most prolific house musicians: Walter B. Rogers (who had also been a cornet soloist with Sousa), Rosario Bourdon, Josef Pasternack, and Nathaniel Shilkret. Details of the Victor recordings are available in the external link below to the EDVR. Sousa also appeared with his band in newsreels and on radio broadcasts (beginning with a 1929 nationwide broadcast on NBC). In 1999, Legacy Records released some of Sousa's historic recordings on CD. In 1922, he accepted the invitation of the national chapter to become an honorary member of Kappa Kappa Psi, the national honorary band fraternity. In 1925, he was initiated as an honorary member of Phi Mu Alpha Sinfonia, the national fraternity for men in music, by the fraternity's Alpha Xi chapter at the University of Illinois. In 1952, 20th Century Fox honored Sousa in their Technicolor feature film Stars and Stripes Forever with Clifton Webb portraying the composer. Fox music director Alfred Newman arranged the music and conducted the studio orchestra for the soundtrack. It was loosely based on Sousa's memoirs, Marching Along. Even after death, Sousa continues to be remembered as "The March King" through a high school and collegiate award program for marching band. The John Philip Sousa Foundation, a non-profit organization founded in 1981, recognizes one superior student in marching band for "musicianship, dependability, loyalty, and cooperation." 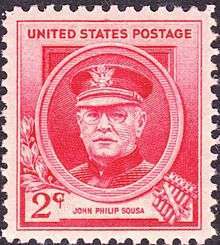 The John Philip Sousa Foundation provides awards, scholarships, and projects such as The Sudler Trophy, The Sudler Shield, The Sudler Silver Scroll, The Sudler Flag of Honor, The Historic Roll of Honor, The Sudler Cup, The Hawkins Scholarship, National Young Artists, The National Community Band, and The Junior Honor Band Project. ↑ Bierley 2001, p 23, 241. 1 2 3 4 5 6 7 "The Library of Congress Biography: John Philip Sousa". Archived from the original on December 9, 2010. Retrieved January 10, 2008. ↑ Warfield, Patrick. "John Philip Sousa." In Immigrant Entrepreneurship: German-American Business Biographies, 1720 to the Present, vol. 4, edited by Jeffrey Fear. German Historical Institute. Last modified May 27, 2014. ↑ "Biography". Sousa and His Band. Dallas Wind Symphony. Retrieved 21 November 2012. ↑ "Biography of John Philip Sousa". A Capitol Fourth – PBS. Capital Concerts. Retrieved 1 January 2013. ↑ James A. Garfield (1989). "Inaugural Addresses of the Presidents of the United States". Archived from the original on December 9, 2010. ↑ Benjamin Harrison (1989). "Inaugural Addresses of the Presidents of the United States". Archived from the original on December 9, 2010. ↑ "Sousaphone". Virginia Tech Music Dictionary. Virginia Tech University. Retrieved 1 January 2013. 1 2 Bierley, Paul Edmund, "The Incredible Band of John Philip Sousa". University of Illinois Press, 2006. ↑ "The Sousa Band". America's Story. Library of Congress. Retrieved 1 January 2013. ↑ "The Incredible Band of John Philip Sousa". Amazon.com. p. 46. Retrieved 2012-12-06. ↑ McSherry Jr., Jack L. "John Philip Sousa". The Spanish-American War Centennial Website. Retrieved 1 January 2013. ↑ "Lineage Book - National Society of the Daughters of the American Revolution, Volumes 61-62". Daughters of the American Revolution, 1922. Daughters of the American Revolution, 1922. p. 165. Retrieved August 13, 2015. ↑ "Congressionalcemetery.org". Congressionalcemetery.org. Retrieved 2012-12-06. ↑ "The John Philip Sousa Bandshell". Port Washington, NY Patch. Patch. Retrieved 1 January 2013. ↑ Register of the Commissioned and Warrant Officers of the Navy of the United States and of the Marine Corps to January 1, 1890. Government Printing Officer. Washington, D.C. 1890. pg. 171. ↑ New York Times. August 1, 1892. ↑ Bierley 2001, p 250. ↑ Bierley 2001, p 78. ↑ "Sousa, John Phillip - Inductees". traphof.org. ↑ "John Philip Sousa". psu.edu. ↑ The Sousa Archives and Center for American Music. "John Philip Sousa Music and Personal Papers, circa 1880-1932.". Retrieved 12 November 2015. ↑ "US Code: Title 36, 304". Cornell Law School. October 30, 2006. Archived from the original on December 9, 2010. Retrieved November 2, 2006. ↑ "Who's Who in Navy Blue". Wingert-Jones Music Inc. Retrieved 2012-12-06. ↑ "Troop A – The Encyclopedia of Cleveland History". Ech.case.edu. Retrieved 2012-12-06. ↑ "Minnesota March". University of Minnesota Marching Band. University of Minnesota School of Music. Retrieved 11 January 2016. ↑ Frank, Brendan. "The Legacy of Illinois Bands". Illinois Bands. College of Fine and Applied Arts – University of Illinois. Retrieved 30 November 2012. ↑ "Sousa writes special march for Nebraska". The Daily Nebraskan. Lincoln, Nebraska. 22 February 1928. Retrieved 30 November 2012. ↑ "History – Kansas State Bands". Kansas State Bands. Kansas State University Bands. Retrieved 30 November 2012. ↑ "Student Organizations – Band". Marquette Archives | Raynor Memorial Libraries. Marquette University. Retrieved 30 November 2012. ↑ "Vocal score of The Charlatan". Archive.org. 2001-03-10. Retrieved 2012-04-07. ↑ "John Philip Sousa". Guide to Musical Theatre – Operetta. The Guide to Musical Theatre. Retrieved 1 January 2013. ↑ "My religion lies in my composition". Brainyquote.com. 1932-03-06. Retrieved 2012-04-07. 1 2 3 "John Philip Sousa". National Trapshooting Hall of Fame. Archived from the original on May 5, 2008. Retrieved February 25, 2008. ↑ "John Phillip Sousa". Trapshooting Hall of Fame. Retrieved July 29, 2012. ↑ John Philip Sousa (1902). The fifth string. Bowen-Merrill. Retrieved 9 January 2013. ↑ "Pipetown Sandy: Sousa, John Philip, 1854–1932". Free Download & Streaming: Internet Archive. California Digital Library. Retrieved 1 January 2013. ↑ "Willow Grove Park". Wgpark.com. Retrieved 2012-04-07. ↑ John Philip Sousa (1985). A book of instruction for the field-trumpet and drum: together with the trumpet and drum signals now in use in the Army, Navy and Marine Corps of the United States. Ludwig Music Pub. Co. Retrieved 9 January 2013. ↑ Lawrence Lessig, 2008, Remix: making art and commerce thrive in the hybrid economy, London: Bloomsbury Academic. Chapter 1. ↑ "March King: John Philip Sousa Conducts His Own Marches". amazon.com. Archived from the original on December 9, 2010. Retrieved February 25, 2008. ↑ "Prominent Members – Kappa Kappa Psi". Kappa Kappa Psi. Retrieved 1 January 2013. ↑ Brian, Greg. "Phi Mu Alpha Sinfonia Fraternity: A History of this Secret Society for Musicians". Yahoo! Voices. Yahoo! Inc. Retrieved 1 January 2013. ↑ Crowther, Bosley. "Stars-and-Stripes-Forever – Trailer – Cast – Showtimes". The New York Times. Retrieved 13 January 2013. ↑ Lovrien, David. "What is the John Philip Sousa Award for band students?". www.dws.org. Retrieved 2016-10-19. ↑ "Sousa Foundation". www.sousafoundation.net. Retrieved 2016-10-19. Congressional hearing: in Copyright's Communication Policy by Professor Tim Woo, University of Virginia, May 2004 – Caution, 560k PDF. Bierley, Paul E. (2001). John Philip Sousa: American Phenomenon. Alfred Music. ISBN 978-1-4574-4995-6. Berger, Kenneth W. The March King and His Band : The Story of John Philip Sousa. New York: Exposition Press, 1957. Bierley, Paul E. John Philip Sousa: A Descriptive Catalog of His Works. Urbana: University of Illinois Press, 1973. Bierley, Paul E. John Philip Sousa: American Phenomenon. Miami, FL: Warner Bros. Publications, 2001. Bierley, Paul E. The Incredible Band of John Philip Sousa Urbana: University of Illinois Press, 2006. Delaplaine, Edward S. John Philip Sousa and the National Anthem. Frederick, MD: Great Southern Press, 1983. Heslip, Malcolm. Nostalgic Happenings in the Three Bands of John Philip Sousa. Westerville, OH: Integrity Press, 1992. Lingg, Ann M. John Philip Sousa. New York: Holt, 1954. Newsom, Jon, ed. Perspectives on John Philip Sousa. Washington: Library of Congress, 1983. Bierley, Paul E. The Works of John Philip Sousa Columbus, OH: Integrity Press, 1984. Sousa, John Philip. Marching Along: Recollections of Men, Women and Music. Edited by Paul E. Bierley. Boston: Hale, Cushman & Flint, 1928, rev. 1994. Sousa, John Philip. National, Patriotic and Typical Airs of All Lands. N.Y.: Da Capo Press, 1977. Sousa, John Philip. Through the Year with Sousa: Excerpts from the Operas, Marches, Miscellaneous Compositions, Novels, Letters, Magazine Articles, Songs, Sayings and Rhymes of John Philip Sousa. New York: Thomas Y. Crowell &, 1910. Warfield, Patrick, ed. (2010). John Philip Sousa: Six Marches. Music of the United States of America (MUSA) vol 21. Madison, Wisconsin: A-R Editions. Bennett, Jeb. "John Philip Sousa: 100th Anniversary." Marine Corps Gazzette 64, no. 10 (1980): 31–34. Bierley, Paul E. "Sousa: America's Greatest Composer?" Musical Journal 25, no. 1 (1967): 83–87. Bierley, Paul E. "Sousa on Programming." Instrumentalist, December 1973. Bierley, Paul E. "Sousa's Mystery March." Instrumentalist, February 1966. Dvorak, Raymond F. "Recollections of Sousa's March Performances." School Musician, Director and Teacher, December 1969. Evenson, Orville. "The March Style of Sousa." Instrumentalist, November 1954. Fennell, Frederick. "Sousa: Still a Somebody." Instrumentalist, March 1982. Gaydos, Jeff. "Stars and Stripes and Sousa Forever!" Bandwagon, June 1980. Goldberg, Isaac. "Sousa." American Mercury 27 (1932): 193–200. Goldman, Richard Franko. "John Philip Sousa." HiFi/Stereo Review 19, no. 1 (1967): 35–47. Gordon, Marjorie M. "John Philip Sousa: A Centennial-Year Salute to the March King." Musical Journal 11, no. 11 (1954): 28–34. Heney, John J. "On the Road with the Sousa Band." School Musician, Director and Teacher, 1976. Howard, George S. "A New Era for Brass: Sousa's Role." Music Journal, January 1966. Intravaia, Lawrence J. "Wind Band Scoring Practices of Gilmore and Sousa." School Musician, Director and Teacher 36, no. 7 (March 1965): 62–63. Larson, Cedric. "John Philip Sousa as an Author." Etude, August 1941. Mangrum, Mary Gailey. "I Remember Sousa." Instrumentalist 24, no. 5 (1969): 38–41. Mangrum, Mary Gailey. "Sousa the Patriot." Instrumentalist 24, no. 6 (1970): 33–35. Marek, George Richard. "John Philip Sousa." HiFi/Musical America 23, no. 11 (1973): 57–61. Mathews, William Smith Babcock. "An Interview with John Philip Sousa." Music: A Monthly Magazine 9 (1896): 487–92. Mayer, Francis N. "John Philip Sousa: His Instrumentation and Scoring." Music Educator's Journal, January 1960. Peterson, O. A. "The Human Side of Sousa." Musical Messenger, May 1916. Pleasants, Henry. "A Look at Sousa: Ormandy and Critics." International Herald Tribune (Paris Edition), December 1969. "Sousa and His Mission." Music: A Monthly Magazine 16 (July 1899): 272–76. "Sousa as He Is." Music: A Monthly Magazine 14 (May 1899). "Sousa's New Marine Band." Musical Courier, November 9, 1892. Stoddard, Hope. "Sousa: Symbol of an Era." International Musician, December 1948. Thomson, Grace F. "Memories of the March King." Musical Journal 22, no. 5 (1964): 27–49. Trimborn, Thomas J. "In the Footsteps of Sousa." Instrumentalist 35, no. 4 (1980): 10–13. Wimbush, Roger. "Sousa at the "Proms"" Monthly Musical Record 68:238–40. Bly, Leon Joseph. "The March in American Society." Diss., University of Miami, 1977. Bowie, Gordon W. "R. B. Hall and the Community Bands of Maine." Diss., University of Maine, 1993. Carpenter, Kenneth William. "A History of the United States Marine Band." Diss., University of Iowa, 1971. Church, Charles Fremont. "The Life and Influence of John Philip Sousa." Diss., Ohio State University, 1942. Darling, Matthew H. "A Study and Catalogue of the Solos Composed, Arranged, and Transcribed for Xylophone and Band by John Joseph Heney (1902–1978), Percussionist (1926–31) and Xylophone Soloist (1931) with the John Philip Sousa Band." Diss., University of Arizona, 1998. Hemberger, Glen J. "Selected Songs for Chamber Winds and Soprano: Rediscovering a Forgotten Repertoire of John Philip Sousa." Diss., University of North Texas, 2001. Hester, Michael E. "A Study of the Saxophone Soloists Performing with the John Philip Sousa Band, 1893–1930." Diss., University of Arizona, 1995. Jorgensen, Michael R. "John Philip Sousa's Operetta El Capitan: A Historical, Analytical, and Performance Guide." Diss., Ball State University, 1995. Korzun, Jonathan Nicholas. "The Orchestral Transcriptions for Band of John Philip Sousa: a Description and Analysis." Diss., University of Illinois at Urbana-Champaign, 1994. Kreitner, Mona Bulpitt. "'A Splendid Group of American Girls': The Women Who Sang with the Sousa Band." Diss., University of Memphis, 2007. Norton, Pauline Elizabeth Hosack. "March Music in Nineteenth Century America." Diss., University of Michigan, 1983. Stacy, William Barney. "John Philip Sousa and His Band Suites." Diss., University of Colorado, 1973. Summers, C. Oland. "The Development of Original Band Scoring from Sousa to Husa." Diss., Ball State University, 1986. Warfield, Patrick. ""Salesman of Americanism, Globetrotter and Musician" the Nineteenth-century John Philip Sousa; 1854 – 1893." Diss., Indiana University, 2003. Whisler, John A. "The Songs of John Philip Sousa." Diss., Memphis State University, 1975. Wright, Maurice. "The Fifth String: an Opera in One Act." Diss., Columbia University, 1989. J. P. Sousa Collection. Washington D.C.: Archives of the U.S. Marine Band, 2011. The Sousa Archives and Center for American Music. University of Illinois at Urbana-Champaign, 2011. Wikimedia Commons has media related to John Philip Sousa. Wikisource has the text of a 1900 Appletons' Cyclopædia of American Biography article about John Philip Sousa. Harris, Neil: "John Philip Sousa and the Culture of Reassurance"
Fennell, Frederick: "The Sousa March: A Personal View"
The Feast of the Monkeys – the "nonsense verse" that Sousa wrote. "The Fairest of the Fair"